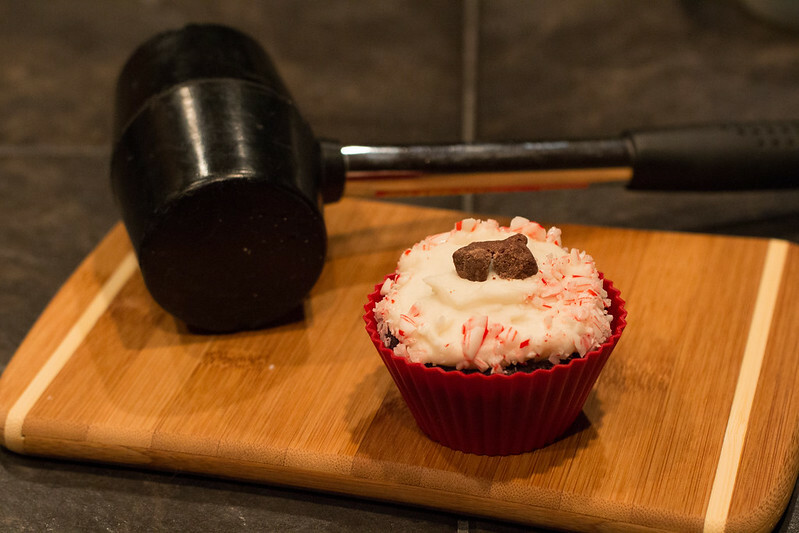 My plan for this was “make chocolate cupcakes, dip in candy canes, take to work” but here’s a more descriptive version in case you don’t, say, have a favourite chocolate cupcake recipe. 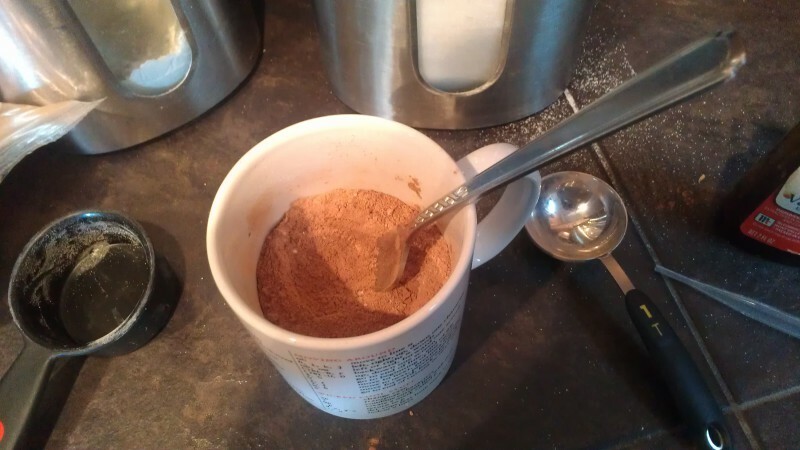 Mix the dry ingredients (and get rid of any lumps in the cocoa). 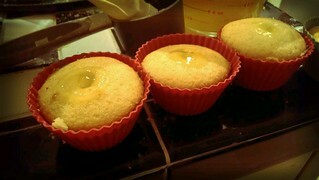 For mini cupcakes, cook 10 min. 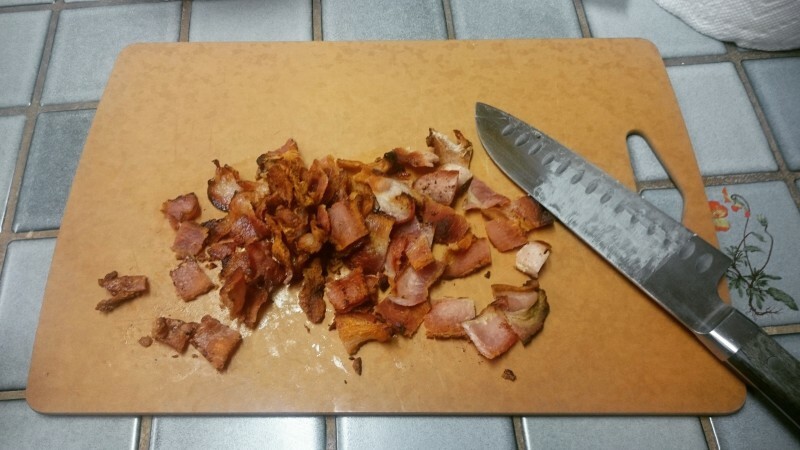 For normal sized ones, cook around 18 mins, or until a toothpick inserted can be removed cleanly. Note that I actually make mini and normal sized cupcakes in the same batch. In this case, just pull the tray out of the oven after 10 minutes and grab the little ones off (the silicon liners make it possible for me to do this bare handed, but your mileage may vary), then put the rest back in once you’re done. This may make the tops of the big ones look a bit less than perfect (as you can see in the back of the picture above), but it doesn’t matter since you’ll be covering them anyhow. Then add alternating icing sugar and milk until you have enough icing. You don’t actually want that much for this, as the extra candy on the side will make them pretty sweet. My cake is actually vegan, so if you wanted to replace this with some sort of vegan icing, you could change this up. 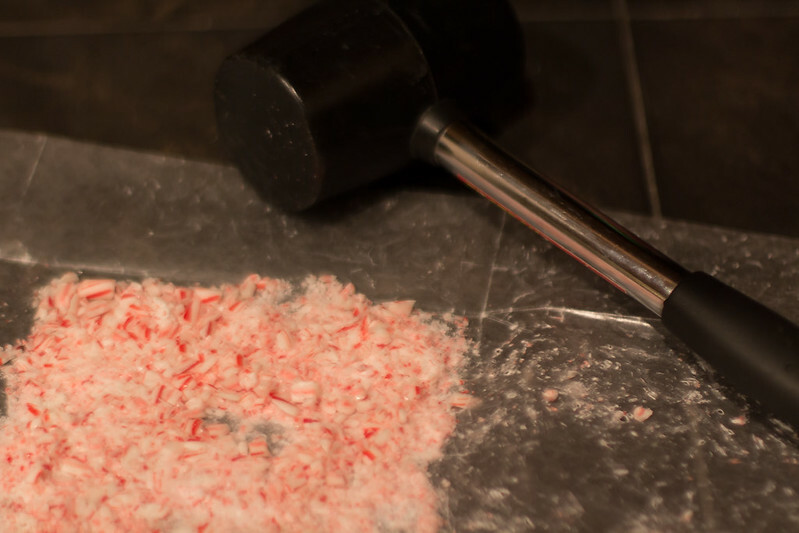 I suspect a water-icing sugar glaze would be enough to keep the candy canes on if you were so inclined. John helped with the unwrapping and crushing duties! 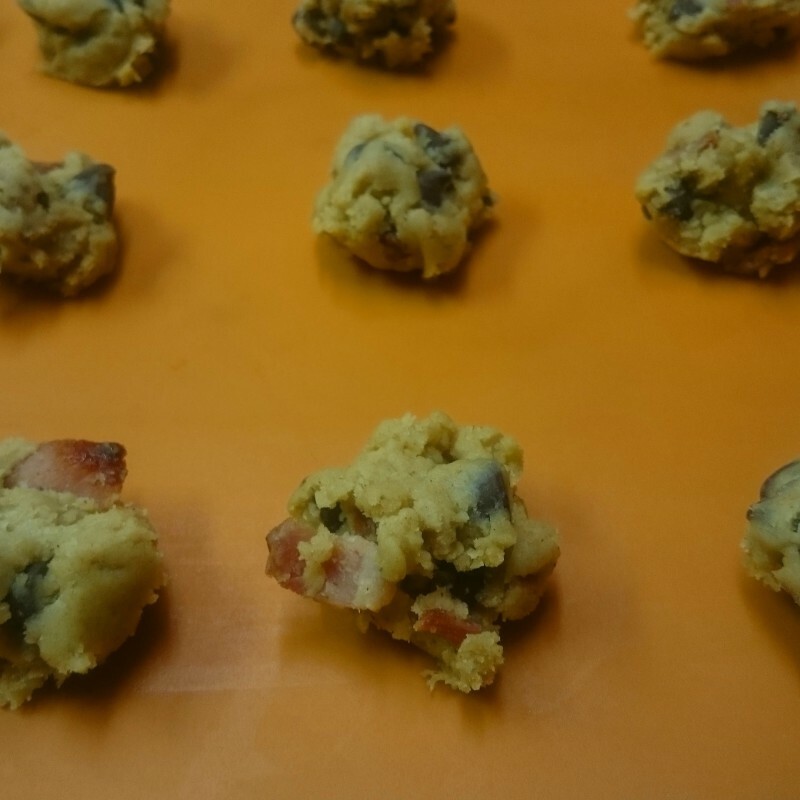 You could, of course, dip them and cover them entirely, but they’re already pretty sweet and crunchy so I figured less is more here. 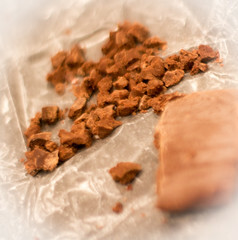 I had some leftover fudge so we used that as a final garnish for maximal abuse of new year’s resolutions. Here’s a few extra photos I took in aid of this week’s AAW assignment, which is to use foreground/background to tell a story about two (or more) items, one in focus and one blurred. 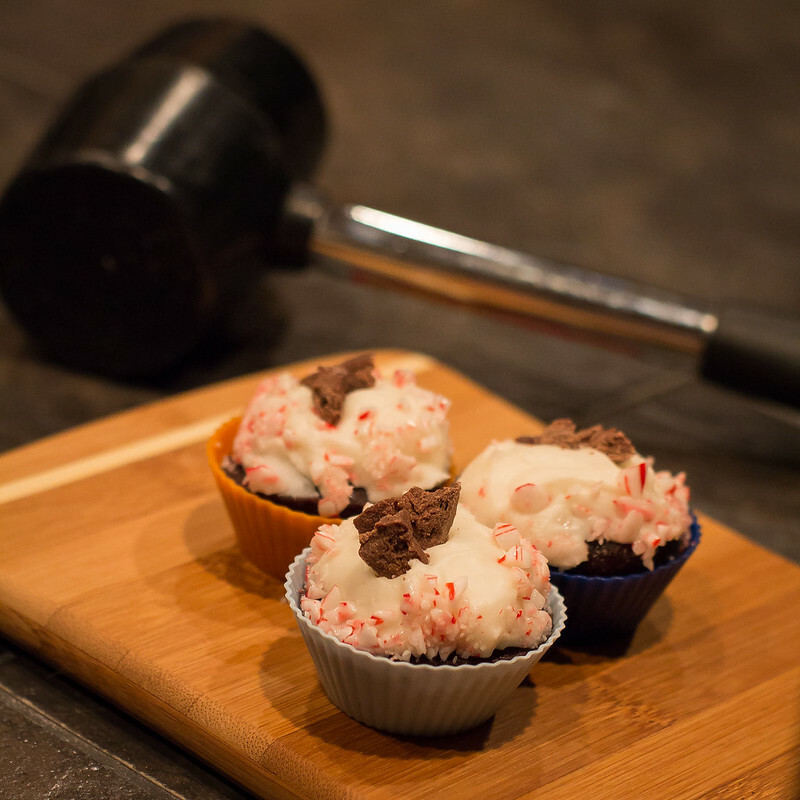 I thought the rubber mallet we used for crushing candy canes was kind of a funny contrast with the finished cupcakes. 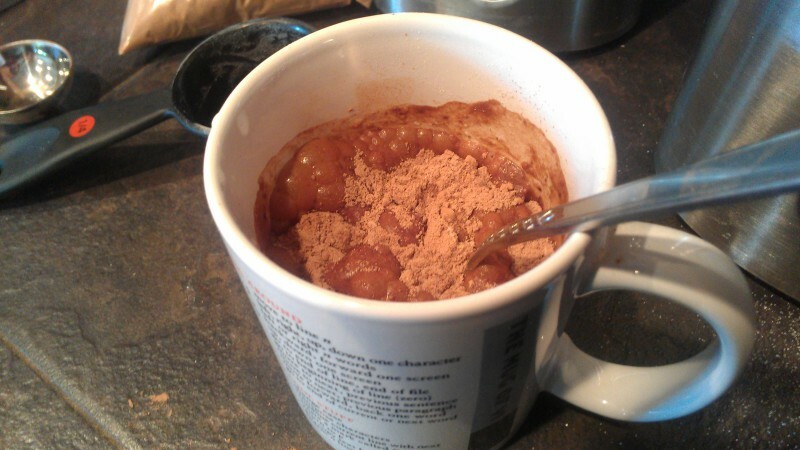 Basically, put it in the mug and mix, then stick the whole thing in the microwave. 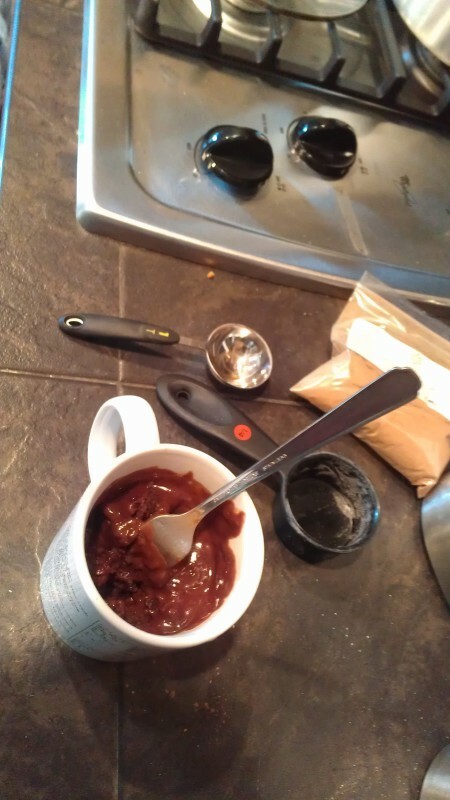 I mixed the dry up first, since my sugar is pretty lumpy at the moment (apparently no one ever told my boyfriend that one must actually keep the sugar container sealed…). Then added the wet. If you’re like me and use a pipette to handle “1 or 2 drops” lest there be a vanilla disaster (yummy but expensive), you can rinse it out using the water that’s going into the cupcakes anyhow. And mix. Bubble bubble, toil and trouble, eh? 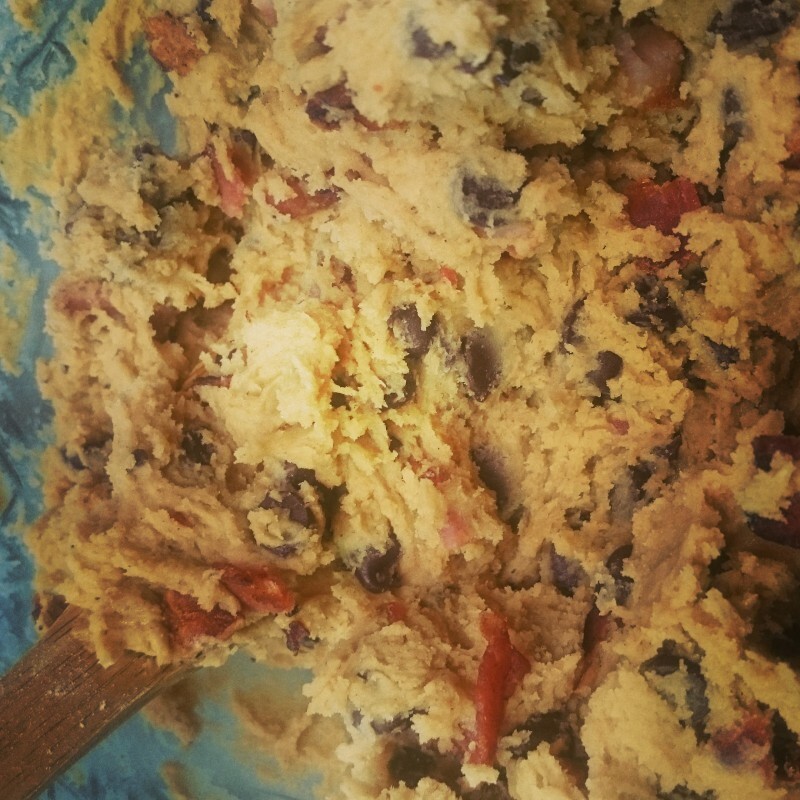 Since there’s no egg in this recipe, you can lick the spoon (well, fork in my case). This is a good way to test if the pinch of cinnamon was really enough. In my case, it was, but I’m thinking next time it’ll be cinnamon and cayenne for a mexican mug o’ brownie. Can take the gal out of New Mexico, but you can’t take the New Mexico out of the gal, eh? Warning: even at 40s cook time, this was crazy hot. So hot that I wrote most of this post waiting for it to cool. There’s no reason you have to stick with vanilla extract. I’m going to try a few others since I have them: mint, cherry, banana, maybe root beer since it’s one of the many extracts we have in the house. As I said, I think this would be really excellent with a bit of cayenne to make a Mexican-style chocolate. I’ll bet it’d be nice with a bit of ground ginger, too. Chopped peanuts (or other nuts) would probably be amazing on top. Why not make a whole sundae out of it? The original recipe recommends ice cream, even if I didn’t have any on hand, having just moved. 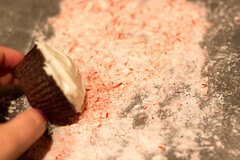 I bet sprinkles would be fun if you’re doing it with kids, just don’t add them ’till after the brownie is cooked. 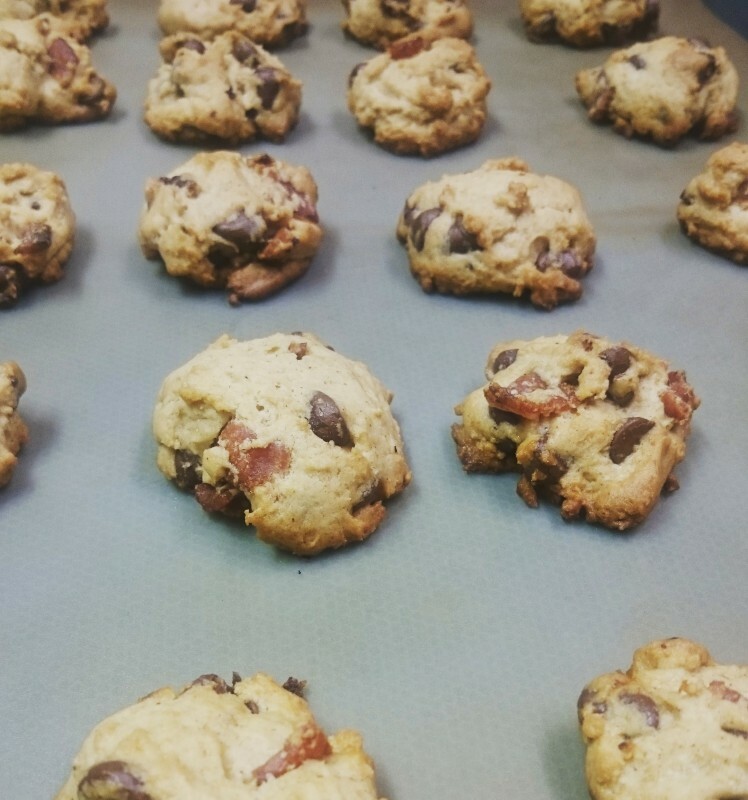 Chocolate chips might work in the mix. I’m worried it might be overkill, but there are days where overkill chocolate brownie sounds like exactly what I need. Cook time will decrease accordingly. I helpfully told my friend Adric that these cupcakes were my way of doing human testing without requiring IRB approval. Remember kiddies, experimental cupcakes are only one step away from mad science because my guinea pigs generally consent to the experiment! These come in three parts; some assembly required. I made up the recipe as a whole based on my recollection and modification of recipes in my head / recipe card box, with some inspiration from the filled cupcakes in Vegan Cupcakes Take Over the World (although this is not a vegan recipe). Cream butter and sugar together; add egg, vanilla, lemon zest and milk and stir well. Add baking powder and flour and stir until smooth (but no longer). 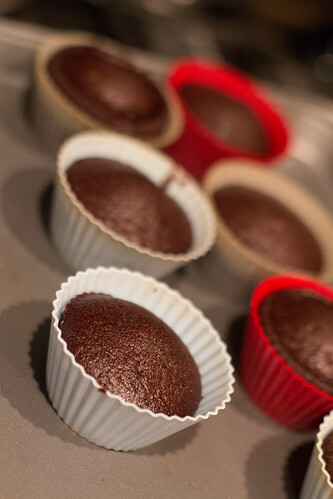 Spoon into cupcake liners (or I use silicone molds), filling about halfway. We made 16 cupcakes, you might want to fill a bit higher to get 12. The name comes via my Ottawa friends: for some reason we decided that “googe” best described the texture of those little gel cup sweets that are considered to be a choking hazard in the US. This nomenclature would probably have died out, but one of my friends was severely grossed out by the word, so we have used it to describe anything of a given gooey texture ever since. You’ll note that this is more or less a lemon pie filling recipe, omitting the egg, or a slightly gooey lemon pudding. 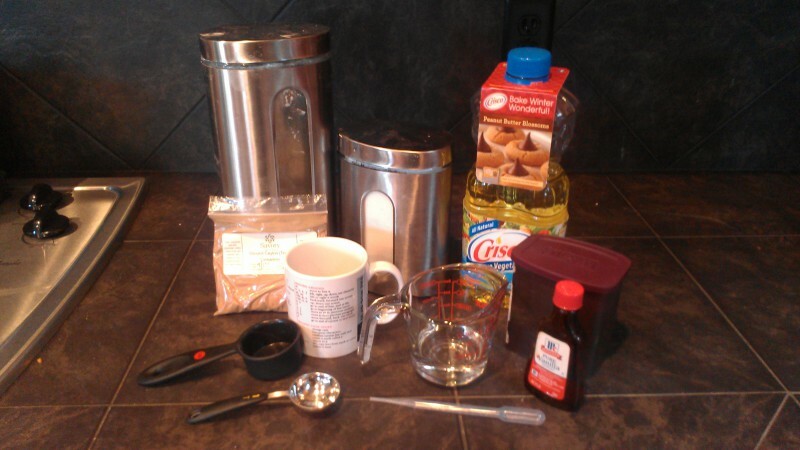 Mix together cornstarch and cold water, then add mixture to hot water along with lemon juice and sugar and stir well. 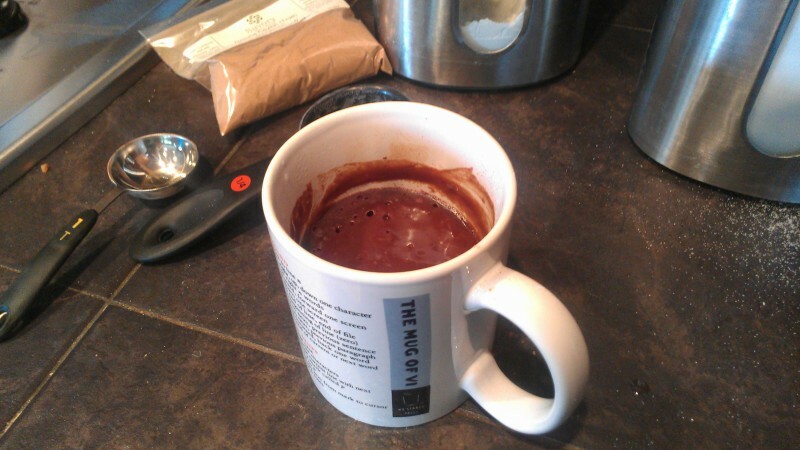 Heat in microwave repeatedly (around 30-45s per time), stirring after each heating, until mixture is thick and no taste of cornstarch remains. You can probably nuke it longer between stirrings, but if it boils once it’s thicker it might splatter all over your microwave, so keep an eye on it. Add food colouring, because normal lemon pie filling gets its colour from egg yolk and you want people to immediately think “lemon” and not “what the heck?” as they might have if you had allowed your lovely assistant to use the blue colouring like he wanted. If you are making mini cupcakes or just don’t plan to lose as much to taste-testing for the sugar, you can probably halve the googe recipe. Or you can allow people to dip the cupcakes in the remaining googe like some sort of weird fondue; I don’t judge. You can add sugar after the fact if you think it needs more — it’ll dissolve, and no one minds getting a blob of icing sugar. 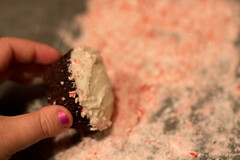 You can’t do this with the cornstarch, though. Figure 2: A metric ton of lemon googe, prior to colouring. (Well, ok, it’s 400ml rounded up.) This may be an excessive amount of googe for a single batch of cupakes; see experimental notes below. I suspect you’re supposed to plan ahead for this and soften the butter and cream cheese in advance, but what I do is nuke those suckers together ’till they’re practically liquid and easy to stir (around 1 min), then add vanilla and sugar ’till it’s a slightly goopy icing consistency, and let it firm up as it cools. This strategy actually does make it easier to deal with the final icing in this case, since it’s easier to spread when a bit more liquid-y, but your mileage may vary. You could probably put some lemon in here too, but at this point that seems like overkill. Get an icing bag with a metal or plastic tip (sorry, this is one time that cutting the corner off a plastic bag probably isn’t enough). 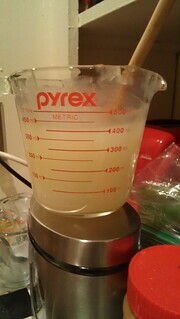 We’ll be using this to fill the cupcakes with lemon googe. 1. 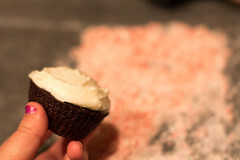 Stab the icing tip into the cupcake. 2. Spoon a tablespoon or so of googe into the bag. Repeat, doing 1 more quickly subsequent times because you are dripping sticky slime all over the counter. I had my lovely assistant do this part so it wasn’t bad for me at all, but you might want to save yourself the trouble and not use the largest icing tip you have on hand. 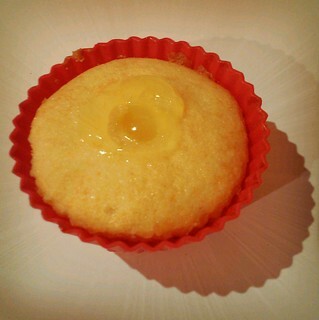 Figure 3: Lubricated lemon cupcakes. 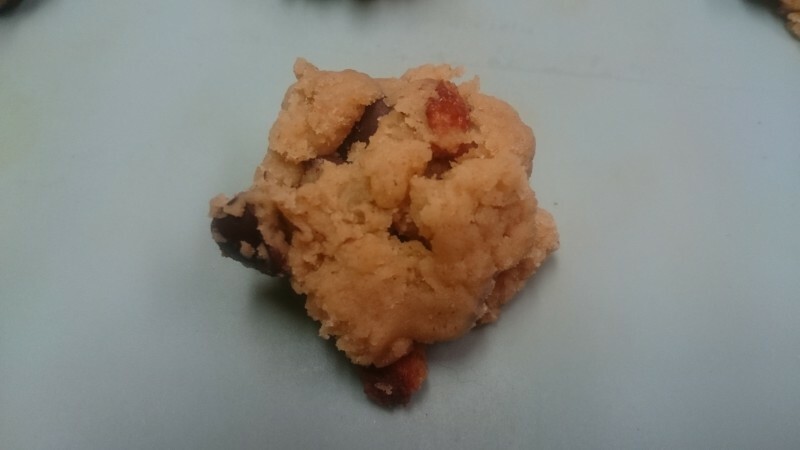 I’m pretty sure this monkier is not going to impress the friend who hates the word googe, but it’s more alliterative so it can be the alternate recipe name. Note the tools in the background include googe, an icing bag, and a place to put the icing bag so it doesn’t googe all over the counter. You now have a cupcake with a gooey hole in it. I will refrain from juvenile jokes, but this may be the point where you’ll be really glad you used the food colouring so your lovely assistant will not think of juvenile jokes. 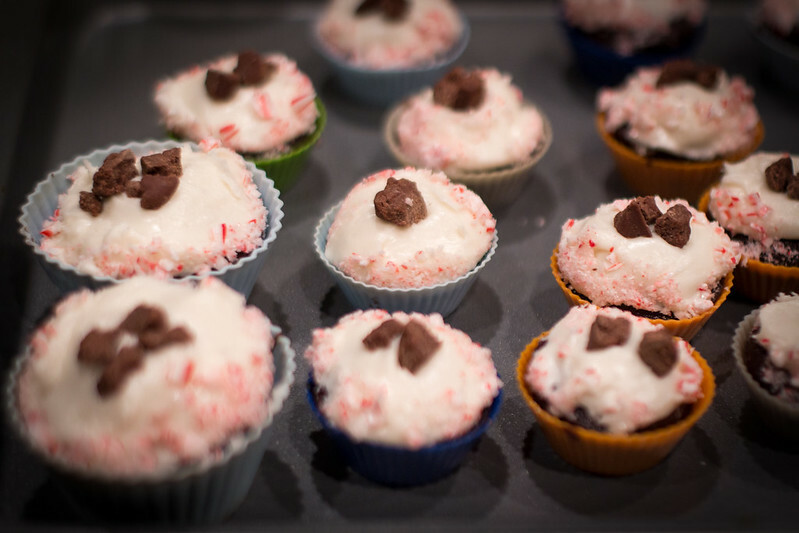 Cover your googe-filled cupcakes with cream cheese icing. This will be challenging because you’re basically holding a lubricated cupcake and the icing will slide off the hole in the center. Having experimented with this, I can tell you that it is easiest to ice the outside and then cover the googe last. It’s also fun to slime the top of the cupcake and layer the icing on that, which will add extra lemony goodness but is also really messy. 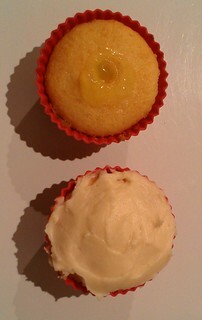 Hypothesis: lemon googe, if inserted into the cupcake 24h+ in advance, will suffuse the cupcake making it more delicious. 16 cupcakes were created in the initial batch. 2 were assembled and eaten immediately and declared delicious by both experimental subjects J and T.
The remaining cupcakes have been divided into two groups. Group one has been filled with googe and iced and placed in the fridge to age for 24h. After the time has elapsed, two prepared cupcakes will be removed from refrigeration and eaten by experimental subjects J and T. If they are deemed an improvement over the freshly assembled cupcakes, the rest of the batch will be prepared in a similar manner. 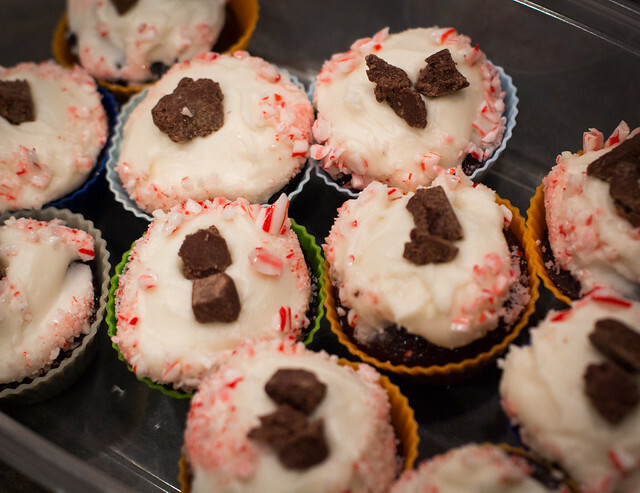 After 48h have passed, experimental subjects will be able to compare 0-day cupcakes, 24h cupcakes, and 48h cupcakes. If the prepared cupcakes are deemed unsuitable at 24h (likely due to structural integrity failures), then the control batch will be left untouched until shortly before the 2600 meeting which will represent our larger clinical cupcake trial. This will not be a double-blinded experiment, although one could be conducted at a later date to more comprehensively test cupcake saturation over time. 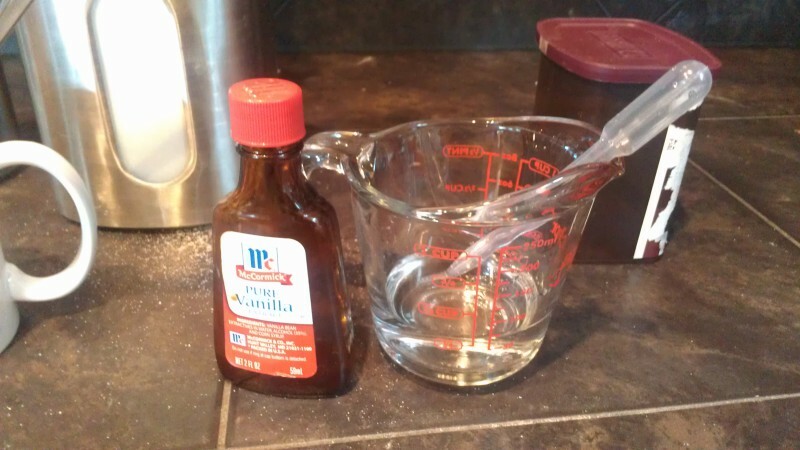 Method: 400ml of googe solution has been prepared and will be inserted into cupcakes as described above. If the cupcakes cannot hold this amount of googe, the remainder will be given to the experimental subjects for consumption or further experimentation. We will report back on crowdsourced solutions for too much googe after the clinical trials are complete. If you wish to participate in this clinical cupcake trial, please attend the 2600 meeting at Quelab on Friday April 5, 2013. Please note that I have not obtained ethics approval for this experiment and you will be participating at your own risk.